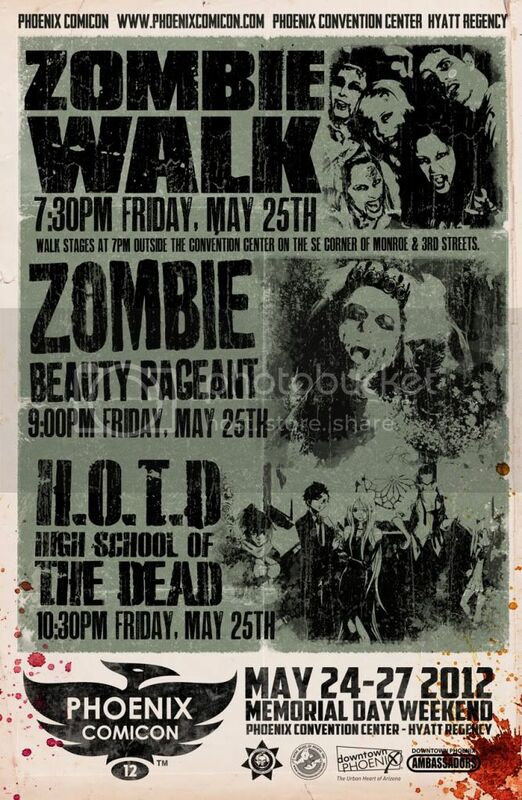 Phoenix ComiCon Zombie Walk, Beauty Pageant, Actor Jon Bernthal, & More May 25, 2012 - Zombiewalk.com - Your source for all Zombie Walk and Zombie Flash Mob planning! Location: Monroe and 3rd st.
Join us for the 5th Annual Zombie Walk! Meet us outside the North Building, staging begins at 7:00pm on SE corner of Monroe and 3rd Streets. More Info under Events. Join Brian & Francisca Pulido has they host this years Zombie Beauty Pageant with AZ Ghostbusters and DOZD. Gaze on has zombie dress their rotted flesh to impress the judges on the catwalk and perform a talent to claim this years crown. We've got scantily clad school-girls, bloodthirtsty zombies, corrupt officials and more. Join Saya, Rei, Seiko and the rest of the gang as they battle against the masses of undead classmates and teachers. Serve with the Department of Zombie Defense [DOZD] and shoot the ooze off those co-deads in the DOZD vs Zombies Epic Battle for Humanity, enter the Braaaaains Eating Contest [21 and over for this one] and stick around while we crown King and Queen Zombies and Humans! The party goes all night with live local DJ's and more blood and gore than you can imagine. Don't miss out. This party is our wildest one yet! Join make-up artists from local film and theatre companies, and fellow educators, to learn to apply zombie makeup that will really catch your student’s attention. Zombies are a big part of popular culture. Educators will learn to maximize student interest in the undead to extend and enrich curricula. Zombie Horde vs Stormtroopers: Who Will Win? What if the mighty Empire faced a Zombie horde? Would the Stormtroopers hardened battle armor protect them from the bites of zombies? Would their blaster rifles destroy the brains of the zombie horde? Our esteemed panel of horror authors discuss how they handle writing Zombie stories and how they put their own spin on the mindless monsters. Join fans of the hit TV show The Walking Dead has they discuss the first two seasons and what they see in store for Season 3. Help answer questions like how does the TV show compare to the comic? Who should they have killed or shouldn't have? Phoenix Comicon will decide once and for all - Slow Zombies - They are dead, that means they can't move fast OR - Fast Zombies - They are infected with a virus that makes them stronger and faster. You help decide!! Don't be a victim. Learn how to prepare for the upcoming zombie apocalypse from the experts. The Department of Zombie Defense will share how to plan and survive. Join Thrill the World and learn how to dance the Thriller. Then go home and suprise your family and friends with what you learned or join in on a Thriller flash dance. The possibilities are endless once you know the Thriller! Actor Jon Bernthal, best known for his role as Sherriff Shane Walsh in AMC's "The Walking Dead" based on the award winning comic series of the same name.